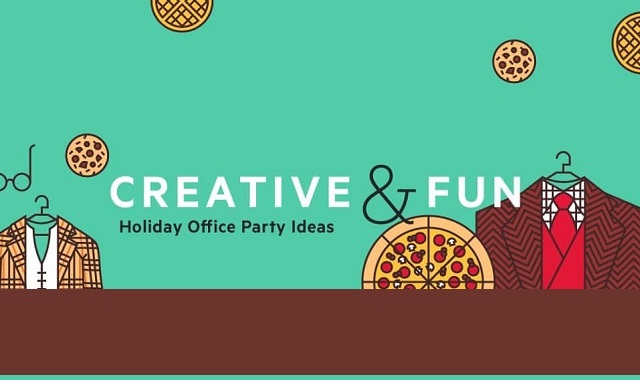 Creative and Fun Holiday Office Party Ideas #infographic ~ Visualistan '+g+"
Throwing an annual office holiday party can be an amazing way to show your team you appreciate them, build company morale and boost employee engagement. While they're designed to be a fun evening of celebration, not everyone is as enthused about the annual office party. More than 50 percent of employees in one survey say they dread their annual office party, and a majority of employees skip it. But there are in fact ways to create an event that employees look forward to—and even feel valued at. Ensure this year’s office holiday party is memorable for all the right reasons. Take time to plan a unique celebration that fits your company culture. Get input from your team on what the party should look and feel like. Use these four fun and creative holiday office party ideas as a launch pad, then keep reading for tips to create a celebration your employees are sure to enjoy.